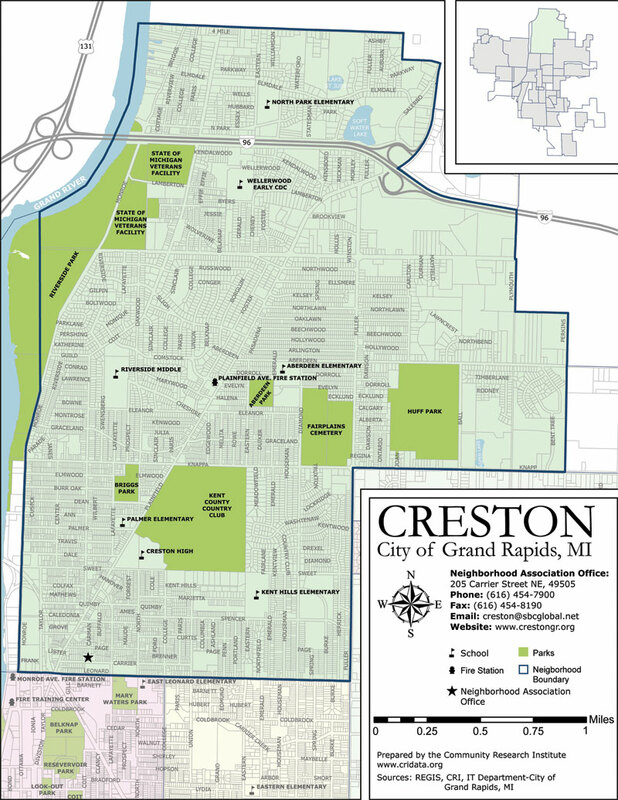 Creston Neighborhood in Grand Rapids is Bounded by Four Mile Road on the north, on the east by Fuller Avenue up to Knapp Street and then along Knapp to the staggered line of the eastern city limits. It is bounded also by Leonard Street on the south, and the Grand River on the west. Some of the features of Creston include Riverside Park, Aberdeen Park, Huff Park, Briggs Park, Kent County Country Club. Creston High School, Palmer Elementary, Aberdeen Elementary, Riverside Middle School, Wellerwood Early Child Development Center, Riverside Middle School, Kent Hills Elementary. Cheshire Business District, and the Creston Business District. Creston is the largest neighborhood in the city by population. It also stretches the longest distance, from Leonard Street to Four Mile Road.